The apprentice arborist technician assists Arborist Technician and receives training in performing arboriculture duties in connection with a wide variety of tree and shrub trimming and maintenance activities. Salary starts at $45,032/yr with increases every six months and ends at $53,248/yr; length of program is 3 years. Possession of a California Class C driver’s license. Requires ability to obtain a California Class B driver’s license and the required International Society of Arboriculture certifications upon completion of apprenticeship. 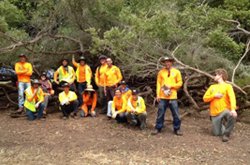 Assist with assessing and evaluating the condition of trees and other vegetation. 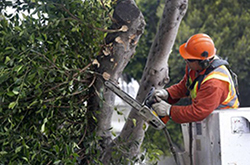 Assist with climbing trees and removing dead, diseased or otherwise damaged or unwanted limbs or tree tops; pruning, felling and cutting up trees; piling trimmings for pick up and disposal. Performing various types of rigging in connection with this program work; operating chain and hand saws, aerial ladder truck, chipper, and other power equipment. The Apprentice Automotive machinists assists in the repair of cars, trucks, buses, motorcycles, all two or four-cycle engines (air or liquid-cooled) and all other work associated with automotive master mechanics, including brakes, chassis, clutch, transmission, drive lines, rear-axle assembly and all phases of engine repair. Apprentices also assist with the work on electrical systems, cooling systems, smog controls, fuel systems, and exhaust systems. 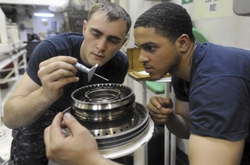 Machine shop apprentice automotive machinists assist with crankshaft grinding, cylinder boring, bench work, machine tool maintenance, engine reconditioning and automatic unit rebuilding. Requires obtaining a Class B Driver's license within two (2) years of appointment. Assists in maintenance, repair, overhaul, and service of heavy-duty and off-road vehicles and power-driven equipment using hand tools, power tools and machine tools such as lathes, drill presses, grinders, boring bars, valves refining tools and other machine tools. Assists in the design, fabrication and welding of parts. Assists with maintaining records of equipment mileage, service/repair logs, materials and parts logs, and equipment and parts orders. Assists with responding to incoming emergency calls and may go to the site of the breakdown; may assist with towing vehicles. Assists with inspecting, testing, and reviewing vehicles and equipment as part of the preventive maintenance program. Automotive mechanics are professionals who are skilled in the repair and maintenance of motor vehicles of all types. An auto mechanic may be called upon to work with cars, trucks, and buses. Because the skills of the mechanic are required in so many different settings, an individual with an aptitude for mechanics can usually find work with ease. An auto mechanic may choose to provide services in a general setting or focus on a particular aspect of the function of motorized vehicles. For example, the mechanic may pursue the acquisition of knowledge that makes it possible to repair cars and trucks that utilized any type of engine and transmission. Others may choose to focus on a subcategory of auto repair, such as becoming proficient in working on diesel engines or manual transmissions. Check back in the fall 2017/winter 2018 for more information on this program. The apprentice performs journey level skilled work in connection with the maintenance, repair, overhaul, removal, replacement and adjustment of the exterior and interior bodies of a wide variety of equipment including automotive and transit equipment. Performs other related duties as required. In preparation for a painting project, auto body painters remove rust and other debris from surfaces to be painted, fill cavities and dents in vehicles to create an even surface, mask or tape off details and components to avoid contamination and select the proper colors and substances for the project. The painting process itself involves using paint sprayers and brushes to apply paint to a vehicle, determining the necessary application of paint for a thorough coat and checking for runs or sags in the paint to ensure a quality product. Apprentice Cement Masons perform routine tasks in support of journey level Cement Masons. Under direct supervision, Apprentice Cement Masons will learn to perform various types of cement work. Responsibilities include safety training, framing, preparing and securing job sites, estimating, removing debris; mixing, pouring and finishing concrete, demolishing concrete structures; operating and maintaining hand and power tools, performing routine maintenance of tools and equipment. Requires possession and maintenance of a valid Class C California driver license. Performs framing work, including placing and finishing curbs sidewalks, gutters, disability access ramps and various other concrete structures. Prepares job sites by setting up safety tripods and scaffolding; may secure confined space job sites. Performs mixing and applying toppings, colors, grout, epoxy overlays, or waterproofing compounds in accordance with job specifications. Participates in demolition of flat work and concrete structures with the proper use of pneumatic tools, such as chipping gun, jackhammer, concrete saw, and other power equipment. Pour and finishes concrete sidewalks, curbs, gutters, streets, disability access ramps, and steps using screeds, trowels and floats. Learns to order materials and estimate concrete; assists in laying out work for new construction or repair by measuring and calculating the correct type, materials and supplies necessary to complete the job. Identifies and uses various hand and pneumatic tools and power equipment; assist in operating ditching machines, trenching machines, or similar equipment; cleans and otherwise maintains tools and equipment; and perform general maintenance. The Apprentice Electric Motor Repairer will assist the journey level worker with the maintenance and repair of a variety of electric motors and other electrical devices, equipment, and machinery such as D.C. and A.C. single and three-phase motors, switches, controls, power tools, heaters, testing equipment, magnetic contactors, motor generators, and other related electrical equipment. Check back in the spring/summer 2018 for more information on this program. The Environmental Service Worker performs routine and basic services to assist laborers and gardeners in maintenance and servicing, including removal of graffiti and debris. 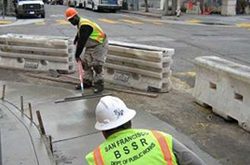 Under direct supervision, the apprentice assists laborers and gardeners in the removal of refuse and dirt from city streets, sidewalks, plazas, stairways, building frontages, parks, playgrounds, and other areas for reasons of public safety, code compliance, health and beautification and maintains city streets, trees and related landscaped areas in a safe, healthy and attractive condition. Any combination of training and experience that would provide the required knowledge, skills and abilities may be qualifying. Essential duties require the following physical skills and work environment: Considerable physical effort, i.e., kneeling, bending and squatting for considerable periods of time; occasional exposure to rain, other inclement weather conditions and somewhat disagreeable working conditions. Assists individually, or as part of a crew, in sweeping and removal of litter in assigned areas; screening of sandboxes for glass and litter; depositing of debris in plastic bags for pickup; and loading of debris on various clean-up trucks such as pickups, flatbeds, dump trucks, and refuse packer trucks. Mixes paints and cleaners according to instructions; scrapes, scours and soda-blasts areas and materials; and applies paint for graffiti removal jobs on a variety of clean-up and graffiti removal jobs. Assists laborer and gardener classes in removing of vegetation and debris from planted areas; weeding; preparing ground for planting; moving/trimming of lawns; operating power lawn mower on lawns and erosion slope areas; pruning trees and plant material with hand and power equipment; watering planted areas with hoses or automatic sprinklers; planting trees; shrubs and groundcover; trapping rodents. Operates power equipment (e.g., high-pressure hot water washers and steam cleaners, compressors, soda-blasting units, chain saws); a variety of small hand tools; lawn mowers, and a computerized color-matching system. Assists in responding to specific service requests generated by the public, department or other City agency. The Apprentice Gardener performs routine and basic duties to assist gardeners in the care of athletic fields, squares, parks, playgrounds, stadiums, thoroughfares, medians and/or other landscaped areas. Some positions may require possession of a valid California Class C driver license. Essential duties require the following physical skills and work environment: Ability to safely and correctly lift, drag and/or move with assistance large and/or heavy plants and equipment to truck bed level and the ability to kneel, bend and squat for considerable periods of time. The nature of the work may require exposure to inclement weather conditions and may require exposure to infectious and/or hazardous materials and/or conditions. Some positions require driving. Some positions may require riding mowers and driving small utility vehicles. Some positions may require weekend or shift work. Waters lawns, planted areas and playfields, manually or by means of automatic sprinklers; uses hand or power mower to cut lawns; fertilizes lawns, shrubs and flower beds. Performs routine and limited trimming and pruning of shrubs and hedges by use of hand or power shears; gathers and disposes of cuttings. With close supervision, sprays herbicides; plants and transplants shrubs or small plants; traps or destroys rodents; assists in the renovation of lawns or play areas. Rakes and weeds lawns; weeds and cultivates planted areas; cleans restrooms or other auxiliary buildings in a playground or park. Removes debris and litter; sweeps and otherwise cleans play areas, paths or roadways; removes trash; assists in the loading of debris on truck. 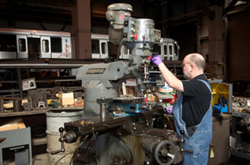 The Apprentice Maintenance Machinist assists the Maintenance Machinist in the operation and maintenance of fabrication, installation, maintenance and repair of communication equipment, Municipal Railway equipment, fire alarms, machinery, instruments, castings and valves; performs related duties as required. Maintenance machinists repair or make new parts for existing machinery. After an industrial machinery mechanic or maintenance worker discovers the broken part of a machine or vehicle, they give the broken part to the machinist. To replace broken parts, maintenance machinists refer to blueprints and perform the same machining operations that were needed to create the original part. Machinists use machine tools, such as lathes, milling machines, and grinders, to produce precision metal parts. Many machinists must be able to use both manual and CNC machinery. CNC machines control the cutting tool speed and do all necessary cuts to create a part. Assists with setting up and operating a variety of machine tools, stationary as well as portable manual machine tools and Computer Numeric Control (CNC) machine tools such as mills, lathes, drills, saws etc. Assists with rebuilding, refinishing, modifying, and/or fabricating replacement parts for pumps, generators, cranes, parking meters, transit vehicles/railway coaches and railway cars, fire alarm boxes, compressors, dredges, pipes lines, barges, ferry terminals and their components. Assists with maintaining and repairing a variety of instruments and mechanical equipment, including valves, castings, and various metal parts. Assists with diagnosing, installing, inspecting and testing machinery, parts and equipment. Assists with reading and interpreting schematic drawings, blueprints, and plans. Apprentice Pile Workers will learn to perform a variety of manual work in the repair and construction of piers, wharves and related substructures. They will usually start out helping journeymen Pile Worker with the basic tasks like material handling and move into more sophisticated jobs as their knowledge and skills increases. The essential functions of Apprentice Pile Workers are assisting Pile Worker in placing, driving and capping piles; placing stringers, sawing and laying decking; boring holes and framing timbers; tearing out decayed and damaged decking, stringers caps and pilings. In addition, the Apprentice Pile Workers are also responsible for assisting in moving and rigging the Pile Driver and/or truck crane; making minor repairs to Pile Driver machinery and equipment; fabricating rigging, both wire rope and synthetic line such as block and tackles, slings, chokers, pennants and related gear; building maintaining and using floats, pontoons, or work boats in the maintenance and repair of piers and docks. Apprentice Pile Workers assist using and maintaining a wide variety of pneumatic and portable gas tools such as drills, sanders, wrenches, saw, forklifts, torches, boring machines and other related tools. Assists in performing a variety of manual work in the repair and construction of piers, wharves and related substructures by removing and replacing decayed and/or damaged caps, stringers and decking; pulling, driving, framing and bolting piles; burning old bolts; and repairing docks. Assists in loading or unloading piles, timbers or debris to or from trucks or barges. moving and rigging the Pile Driver by setting up, tearing down and resetting rigging. Assists in making minor repairs to Pile Driver machinery and equipment by fabricating rigging, both wire rope or synthetic line such as block and tackles, slings, chokers, pennants and related gear. Assists in sending down equipment and tools to the diver and in building and maintaining floats, pontoons, workboats and rafts. An electrician who works outdoors installing and maintaining equipment and facilities for electrical power transmission and distribution is known as an electrical lineman. The electrical power lineman's tasks may include installation and repair of overhead or underground power lines as well as installation, maintenance, and repair of other electrical subsystems and components. 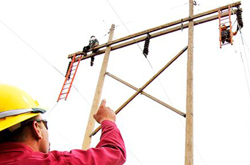 Advanced linemen may also be involved in the design and layout of electrical systems. Other electricians, such as those who work on indoor electrical systems or on low voltage equipment for communications systems, are not considered electrical linemen. Assists in the installation, repairs, and maintenance of high-tension overhead transmission systems, related feeder lines, towers and poles; may perform such maintenance activities when lines are de-energized. Assists in the maintenance of, operation, and adjustments to electrical transmission and primary power substations ranging from 600 to 230,000 volts, including circuit breakers, relays, batteries, and controls. Assists in the installation and maintenance of underground and overhead power lines and feeders and related auxiliary equipment; locates and isolates faulty sections and assists in the removal, installation and corrections where necessary. Assists in the installation of watt-hour meter systems, connection of potential transformers, current transformers, phase shifting transformers, test switches, reactive meters, demand meters, and watt-hour meters. Assists in the maintenance, operation, and repairs of overhead and underground high voltage transit line systems. Work may involve working in underground vaults, subway tunnels, and subway stations. The Apprentice Stationary Engineer works under the immediate supervision of a qualified journey level stationary engineer during the first two years (or 5200 hours) of the four-year apprenticeship required by the trade through diversified experience, on-the-job training, and related instruction. The work of stationary engineers is varied and complex. Stationary engineers perform work on boilers and steam systems; heating, ventilating and air conditioning systems; building automation systems; diesel engines, turbines, generators; pumps, piping and compressed gas systems; refrigeration and electrical systems and numerous other physical plant functions. Assists in the operation and maintenance of boilers, burners, combustion control devices, steam valves, traps and accessories, heating systems, ventilation and air-conditioning systems, radiators, refrigeration systems and equipment, elevators, water pumps and valves, water draining systems and alarm systems. Assists in the repair and adjustment of switchboard controls, electric motors, generators, air compressors, ventilating fans, circuit breakers, elevators, laundry machines, pumping plant equipment, cable winding machinery and other equipment. Assists in inspection and use of fire prevention equipment and safety equipment to assure proper functioning. Assists with contacting and communicating and is required to deal with contractors, building tenants and/or the general public in order to be able to discharge assigned duties. The Apprentice Stationary Engineer works under the immediate supervision of a qualified journey level stationary engineer during the first two years (or 5200 hours) of the four-year apprenticeship required by the trade through diversified experience, on-the-job training, and related instruction. The work of stationary engineers is varied and complex. Stationary engineers perform work on boilers and steam systems; heating, ventilating and air conditioning systems; building automation systems; diesel engines, turbines, generators; pumps, piping and compressed gas systems; refrigeration and electrical systems and numerous other physical plant functions. 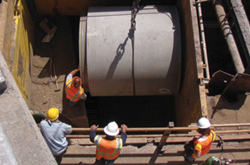 This is apprenticeship program is specialized in sewer plant work. Assists in visual inspection and/or manual tests of all plant machinery equipment in an assigned area or pumping station for proper operation. 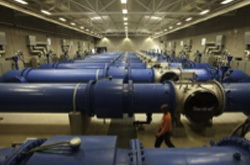 Assists in adjusting valves and controls as required to maintain proper flow and treatment of sewage. Assists in taking periodic readings of gauges and meters, in charting and recording results in plant operating logs. Assists in performing a variety of manual tasks requiring the handling of equipment exposed to raw sewage; collecting raw sewage samples on prescribed schedule at specific locations; may assist in making simple chemical analyses of samples collected. 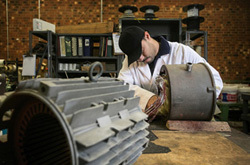 Assists in making major and minor repairs to all treatment plant and pumping stationary machinery including pumps, grit collectors, conveyors and washers, chlorinators, evaporators and storage tanks, sludge collectors, drive units, deodorizing equipment and a variety of metering and recording devices; assists in lubricating, greasing and cleaning machinery and equipment and maintaining work areas in a clean and orderly fashion; assists in servicing contacts on electric motor line starters, auxiliary relays and automatic switches. Assists in the operation and maintenance of pumping, heating, ventilating and auxiliary plant machinery and equipment; assists in repairs and adjustments to electric motors, boilers, pumps, compressors, alarm systems, switchboards, controls) elevators and other machinery. The work of stationary engineers is varied and complex. Stationary engineers perform work on boilers and steam systems; heating, ventilating and air conditioning systems; building automation systems; diesel engines, turbines, generators; pumps, piping and compressed gas systems; refrigeration and electrical systems and numerous other physical plant functions. 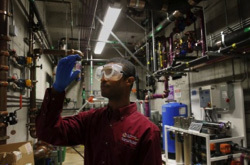 This is apprenticeship program is specialized in water treatment plant work. Assists in operating automatic and manually controlled purification and water treatment equipment including pumps, motors, chemical feeders and filters. Assists in performing water analysis to maintain proper quality and chemical dosage in a filtration plant; assists in performing control tests on water samples to determine chlorine residual, pH, alkalinity, turbidity, color, odor, saturation index and flocculation factors; maintain appropriate logs and reports. Assists in the operation and maintenance of switching and controlling equipment, motor driven pumps, generators, motor, air compressors, ventilating fans, circuit breakers, elevators, condensate and sump pumps, water heating and pumping equipment and other equipment. Apprentice track maintenance workers assist in the repairing and rebuilding of the railroad track, using power and non-power hand tools as necessary. They lift and carry track material, cut brush, trees and vegetation, and clear the right-of-way of litter and cargo spillage. Maintenance is performed by pulling spikes from ties, drilling holes through rails for insertion of bolts, and fastening, tightening or loosening bolts. Apprentice track maintenance workers are responsible for assisting the journey worker in keeping the track and track bed in good shape, which means checking for broken rails, defective switches, deteriorating track bed, track obstructions, shifting loads and spillage, and weather-related problems. The type of equipment used includes air hammers, air- or gas-powered wrenches, rail drills and portable abrasive saws. The Utility Plumber classification includes class 7363 and 7364. 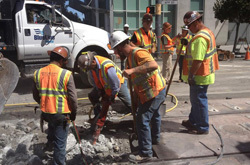 The Utility Plumber Apprentice works under direct supervision of a qualified journey level Utility Plumber during the apprenticeship required by the trade, learning the operation, repair and maintenance of water mains, pipes, meters, fire hydrants, gates and valves. Applicant must be a current indentured UA Local 38 Utility Plumber Apprentice who has not completed more than two (2) years (4000 hours) of their combined work process and classroom study. Assists in the installation and maintenance of new water services and mains or replaces or relocates services with copper, cast iron, wrought iron, plastic, or steel pipe, and bronze, copper or galvanized fittings; drills and taps water mains. Assists in locating and repairing underground and surface leaks on service pipes and water mains; makes repairs under water pressure, using various methods; installs, changes, removes, and makes field repairs to water meters; sets meters and meter boxes in conformity with established sidewalk grades; installs, relocates or changes temporary water mains and makes necessary alterations to water services and meters; removes meters and conducts flow and pressure tests; repairs and maintains high pressure recorders; assists with maintenance of building standpipes; assists in the excavation and backfilling of trenches. Assists in cleaning and maintaining traps; repairs gate valves, changes broken or worn spindles; repacks glands; assists in the operation of gate valves; checks air valves when filling mains; repairs leaks in cast iron mains using leak clamp for minor breaks, or in the case of large breaks, cuts out and removes broken meters or registers on water mains and meters; re-caulks joints on new and old mains; lays out and installs new mains and pertinent fittings; assists with the removal, installation, cleaning and maintenance of all pipes, valves and tanks in and around the reservoirs; assists with performing incidental maintenance or installation of inside plumbing when required. Assists in the laying and maintenance of various types of fire devices, services, parts and equipment, including high and low pressure fire hydrants.